A quaint and uneventful one-hour-flight from Washington brought us to touch down in NYC at JFK airport in the late evening. The January winter weather was a lovely 2 degrees Celsius with little to no snow on the ground, a welcoming break from our brutal arctic freeze conditions in Toronto. My husband and I, being the adventurous pair we are, always choose to use local transportation to get to our hotel if it is easy and manageable, so we took the local NYC subway line (aka the MTA) from the airport with our two small carry-on luggage in tow. The MTA is pretty much like the TTC in every single way, other than the unpleasant aromas and lack of cleanliness within (sorry, NYC!) 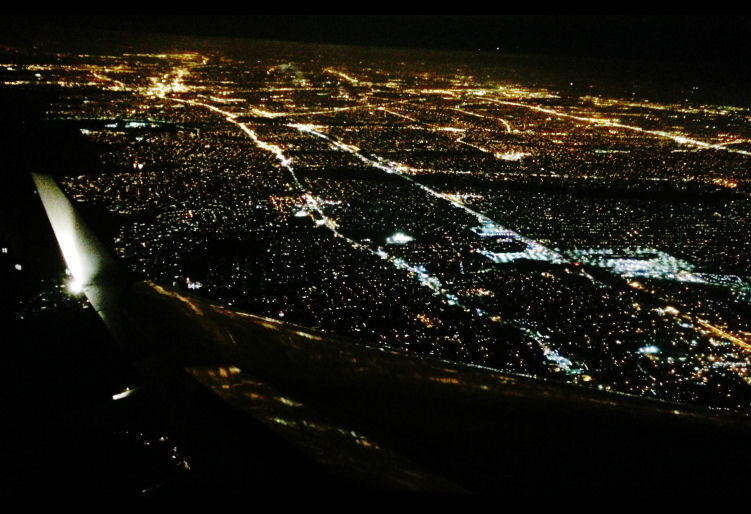 so I felt pretty much at home, even at night. It was accessible and manageable to use and we navigated the stations with relative ease. We exited at Penn Station. 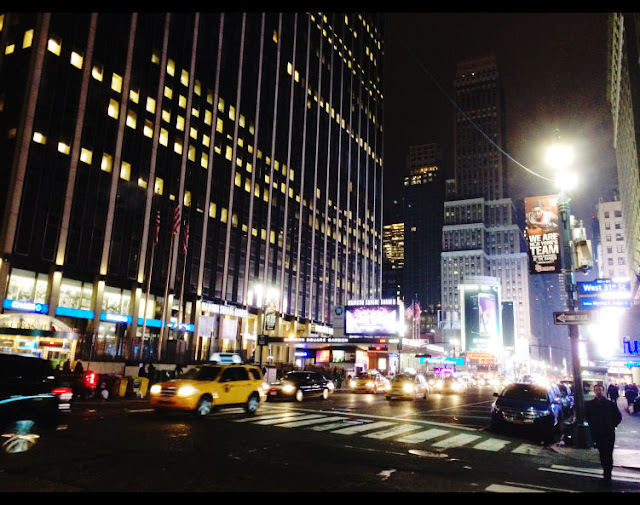 We were staying at the Hilton Fashion District Hotel, which was around a 15 minute walk from Penn Station. 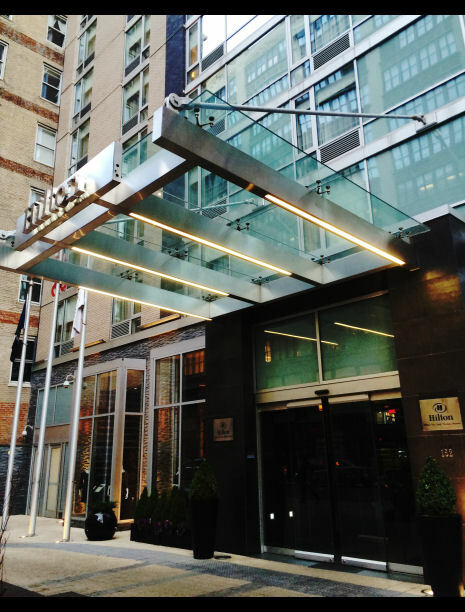 The Hilton New York Fashion District hotel in Chelsea is a four star hotel, and it is located in a lonely side street from a main road. Though I'm really not the type to be picky about how a hotel looks or how fancy shmancy it is, there was an interesting style of décor at this hotel that I have to comment on just for fun. Usually Hilton hotels are classy as heck, but for this location I can only describe the décor as… let’s go with ‘charmingly tacky’. It was decorated with randomly dressed mannequins and clothes-related art pieces… to go along with the Fashion District theme, I guess. The décor didn't take away anything from our stay at all of course, but it was such a unique set up that I just had to mention it! Nonetheless the reception was kind and we soon had our room keys without any trouble. Our room was quite small but well maintained and comfortable, so we settled in to rest a little before heading out in search of food around 11pm. Fortunately, we didn’t have to go far. To my immense pleasure and delight, a Halal West African 24-hour restaurant by the name of “B&D Restaurant” was literally across the street from the hotel. Click here for Location & Photo Gallery via Yelp reviews. This place felt like home right away, and as this was my first time trying West African food, I was incredibly excited! It’s the sort of place that just gives off a friendly-laid back vibe that I can only compare to Roti shops which become the local hangout for a few resident customers. Despite this being around 11pm, at least 5 or 6 brothers were there eating, relaxing, and speaking in French. I later learned that the management and most customers were from Guinea. As you enter you will see this large buffet table with 20 or 30 different dishes, and the cashier in the back. How it works is that you ask for your plate, and after helping yourself to food from the buffet table, they weigh your plate on a scale and you pay for the food by the pound. 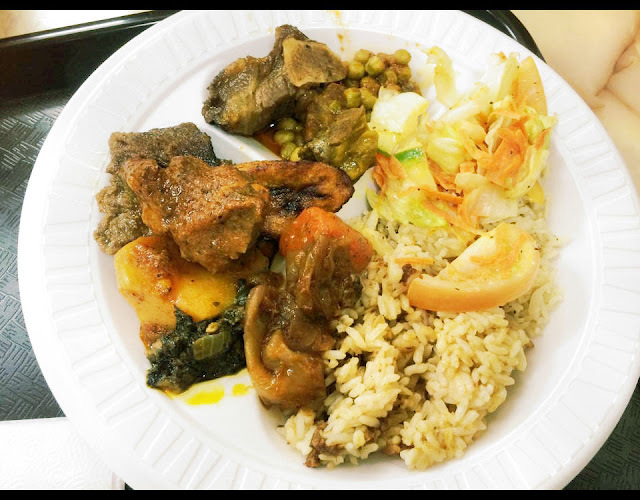 The food was absolutely delicious, it was very similar to authentic Caribbean cuisine but with a little of an accent from smoked or salted fish here and there, which I loved. After a filling and delicious meal we settled in at our hotel and prepared ourselves to experience as much NYC as we could the following day. 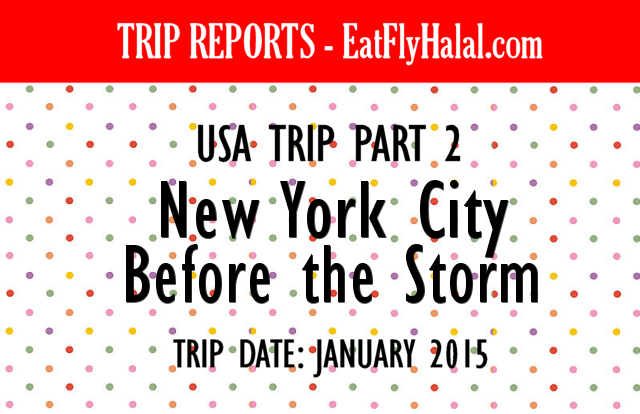 Part 3 - New York Times Travel Show, and Kosher & Halal Food Galore! Waiting is a drag, I know. So how about checking out..
Or.. you can be the coolest dude on the block and Like the Eat Fly Halal Facebook Page!